In drop forging production, we will need making forging dies first for closed die drop forgings. And we call the material of drop forging dies is die steel. So to start a new product,drop forging manufacturers have to buy die steel first.Selecting a die steel supplier is a key decision for all parties, including the die maker,the die user and the end user. Thanks to superior material properties, our customers get reliable tools and components. Our products are always state-of-the-art. Consequently, we have built a reputation as the most innovative dies producer in the world. We produce and deliver high quality drop forgings to more than 100,000 customers in over 100 countries.Together we secure our position as a world-leading supplier of dies and drop forgings. In large press or hammer dies made from prehardened die steel, it is important that the hardness is uniform throughout the block. 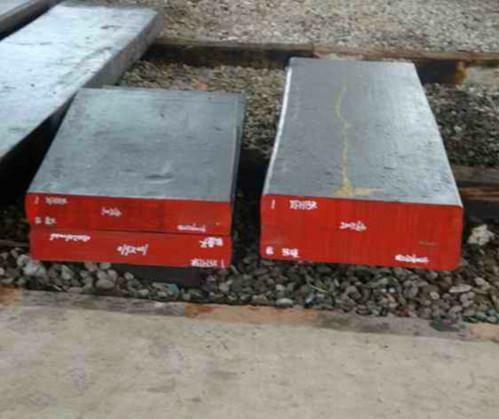 If the die steel has too low hardenability, the block will become softer away from its outer surface and die life for deep cavities or after progressive resinking will be impaired. The surface of the cavity can during use easily develop small cracks or other blemishes which may propagate in an unstable manner under the action of the hot forging stresses,especially at radii etc. Notch toughness indicates the ability of the die steel to resist crack development from such defects. All products, in the tool steel programme for the forging industry, are characterized by the highest levels of toughness and ductility in all directions in the bar or block. Hence, the forger can rest assured that the resistance to gross cracking is the highest possible in dies made from die steel.Proper die preheating will considerably reduce the risk for catastrophic failure via cracking. The better the steel retains its hardness as the temperature or the time increases,the better its temper resistance. Temper resistance can be assessed from the tempering curve for a hardened die steel.In this,the hardness at room temperature is plotted against tempering temperature for given tempering time. Another method of presenting temper resistance data is to plot room temperature hardness against time at a given tempering temperature. In contrast to temper resistance, which is defined in terms of hardness at room temperature, hot strength and hot hardness refer to properties at high temperature. In general, improved temper resistance is associated with increased hot strength and hot hardness. It can be pointed out that good hot hardness and hot strength are important prerequisites for enhanced wear resistance at elevated temperatures. A high level of hot hardness and hot strength is also important in order to achieve adequate resistance to thermal fatigue cracking. In our company,we are not only drop forging manufacturer,but also the manufacturer of individual drop forging dies, introduction of die steel will help you better understand drop forging dies. All the die&tool cost will paid only once, and we will be in charge of dies repaire for free to aviod any defects of further drop forging production. To project the right of our customers,we prove that any forging dies could only use for the customer who pay for it. So pls rest assured that we will not use your dies for other application.